Well, I pulled together my photos and some instructions to share for the reversible flowerpot wrap. The pattern is for a 4 inch terracotta pot. These instructions just show how to make it using two fabrics without any extra embellishing but they would be lovely with a little something extra like some embroidery or beadwork for example. Just be sure to do that part before you cut out your pattern pieces - it will just be easier that way. You can trace your pattern piece onto your fabric first so that you can place your embellishing exactly where you want it to be on your wrap. Before I start with the 'how-tos' let me just add that this is an easy project that would be great for beginner sewers. The trickiest part is sewing around the curves but as long as you take it slowly they shouldn't be a problem. Hopefully you will find it to be a FUN project too - I know I do! You will need: two different fabrics (you only need about an 11x5 inch piece of each so this is a great way to use up scraps! ), two lengths of ribbon about 6 inches each. 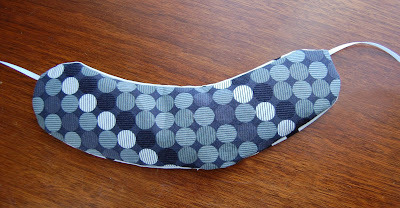 I like this thin grosgrain because it's a little grippier and comes in lots of great colors, a small piece of lightweight interfacing, and a printout of the wrap pattern. 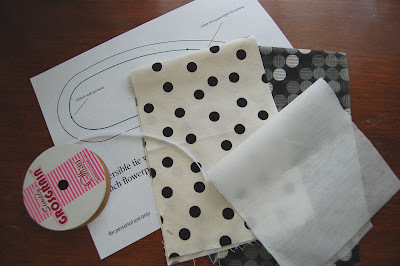 Cut out the pattern piece along the black outer line, pin it to one of your fabrics and cut out your fabric piece. Turn the pattern piece over and repeat this step for the other fabric. 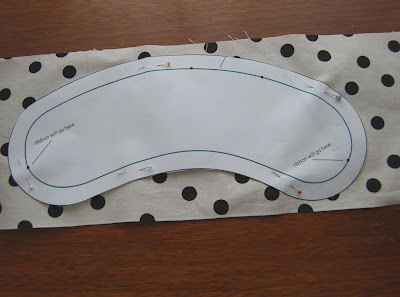 Cut out your interfacing using the inner line as a guide (you can either cut the pattern piece out and pin it to the interfacing as a guide or trace it and cut it if you like). 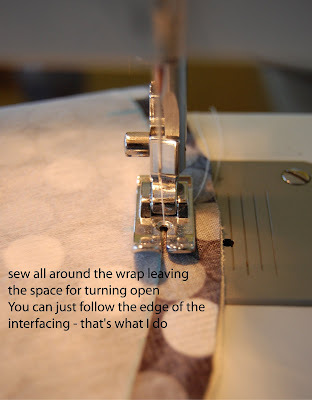 tip: If you are tracing the pattern onto your interfacing you can also transfer your stitching endpoint indicators and ribbon placement indicators - this is really helpful in the next steps. 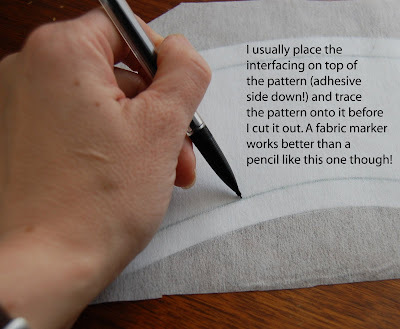 Follow the instructions that came with your interfacing -you saved those, right? and iron the interfacing to the wrong side of one of your fabrics. 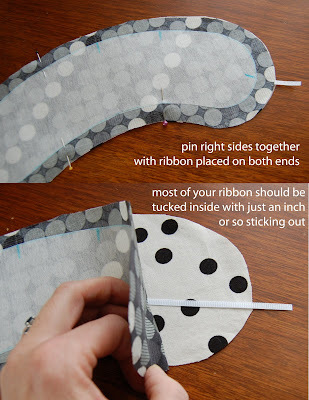 Place your two fabrics right sides together and pin. Place the ribbon pieces on each end of the wrap where indicated. Stitch all the way around the wrap - except between the two dots - you will need that open space for turning the wrap right side out again. 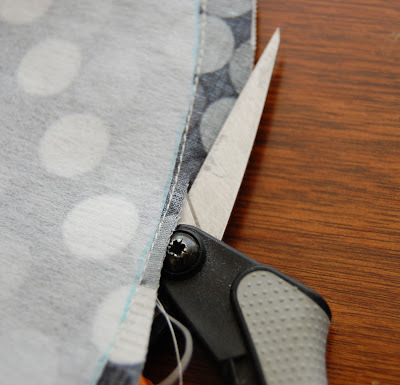 Trim your seam allowances (except between the two dots) and turn right side out. 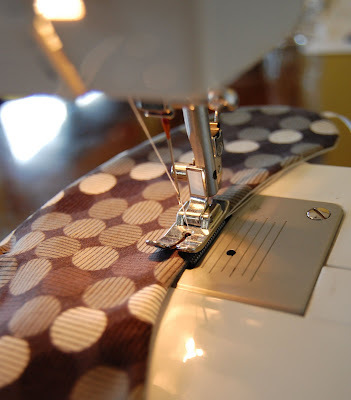 Use a small tool (like the end of a capped pen or something similar) to gently push out the seams along the curves. Notice in this picture how the curve on the left side has been gently pushed out and the one on the right side has not - see what a difference it makes? Press your wrap tucking in the seam allowance for the segment between the two dots. Pin this segment. Topstitch around the wrap catching the seam allowance between the two dots. Try to stitch about 1/8 - 1/4 inch or so from the edge. Take it slow on the curves for best results. Tying the wrap on can be a little bit awkward and it really helps if you have a little helper to lend a finger for holding your knot down. Enjoy! If you have any questions about this pattern or have trouble with any part of the process please let me know! Please stop over at my new flickr group and share photos of your reversible flowerpot wrap. Or check out what others have made with this or other So September patterns and tutorials. It's a great place to find inspiration or inspire other crafters! My word verification is "priest." No kidding. This is a great idea! I don't machine sew but I could try it with felt with some embroidery. And, my word verification is "boupi." I truly belive that one day I will meet someone with a kid with a goofy name and they will tell me it came from Blogger. Nice tutorial. I like your embroidered elephant, too. This is super cute! Thanks so much for sharing, I'll be linking. that's so cute! and what an easy way to add a little special touch in a place no one would think to look. hi there! would love to publish one photo as well as a link to your tutorial. please let me know if this is OK. :) thanks! It's a cute idea but has a problem. Clay pots are designed to "breathe" so that humidity escapes through the clay. You may get mold and mustiness growing in your fabric. You would be much better off doing this to a plastic pot, or perhaps using an oilcloth or plasticky material that helps the pot hold humidity in. You may even want to plan this strategically depending on the plant's needs. Plants that need well drained soil may do well in clay pots that let extra moisture escape. Other plants prefer it wet or they dry out too quickly, so a plastic cover may help the plant thrive in the clay pot. So adorable! I was thinking of ways to jazz up my flower pots. This is perfect! Thanks Amy for bringing up your concern about this project. I have not noticed any mold or mustiness issues with the flowerpot wraps I have been using. They have been there for quite a awhile so I feel pretty confident that it isn't a problem. Luckily they are also machine or hand(if embroidered) washable just in case they need to be refreshed at any point. I appreciate your letting me know about this though and I like your idea about using these with plastic pots or in an oilcloth material :). Would you like to get famous stars' hairstyles with www.discountchristianboots.com Christian louboutian shoes,Would you like to wear famous Hollywood stars www.regilt.com herve leger dress www.discountchristianboots.com Christian louboutian? Here we can help you. All good with big discounts and free shipping. You can also find www.srait.com wholesale jerseys with cheapest price ,www.gavots.com Ed hardy clothing with high quality and free shipping. what could be more worthwhile? A good blog! When an artist talks about living in Japan, should I mention that I lived in Japan, like when I interview Sanford Biggers? Will that make him more open to talking . This post is truly awesome because in this post you shared some important points.Which will helpful in next era.Last not the least i am looking forward to your approaching updates. Well this is new for me!But I like the idea:Flowerpot wrap. Hmmm..You convinced me!I will follow your tutorial step by step. here. Big thumbs up for making such wonderful blog page! Cool, it comprises a set of views that humans are purely natural phenomena, sophisticated beings that evolved to our present state through natural mechanisms such as evolution. I think more people need to read blogs like this. I appreciate the beauty of any flowers design including this reversible flowerpot wrap. The tutorial with pictures makes it more easier for the reader to understand. It is a really good post. Thank you for posting. 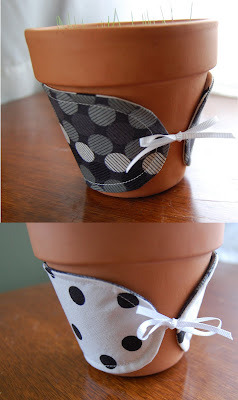 This easy tutorial will really help us reader to an easier way of making reversible flowerpot wrap. I will definitely try this at home since I love placing plants as my home decor. I will going to share it also to my friends. This is a great idea! I don't machine sew but I could try it with felt with some embroidery.